Has Algeria joined Africa’s new ‘cocaine coast’? - The Maghreb Times ! Home Africa Has Algeria joined Africa’s new ‘cocaine coast’? In May 2018, a record 701 kilograms of cocaine were seized by customs authorities in the port of Oran, Algeria’s second largest city. The narcotics were found on board the Vega Mercury in a container of frozen meat. The shipment reportedly started its journey in Brazil, then stopped in the Spanish ports of Las Palmas and Valencia before reaching Oran. Spanish authorities were said to have tipped off their Algerian counterparts. The container ship was ordered by Dounia Meat, Algeria’s largest importer of frozen meat, owned by businessman Kamel Chikhi– nicknamed El Bouchi (The Butcher) – and his brothers. Chikhi and three other members of the company were arrested. The scandal, which became known as “Cocainegate”, led to the dismissal of high-ranking officials, including former national security director General-Major Abdelghani Hamel, whose personal chauffeur was cited in the investigation. What did the seizure mean for Algeria – a country that, until this development, had not been seen as a strategic player in the African cocaine trade? First, it seems unlikely that the cocaine was intended for local consumption. Although the size of the national consumer base remains unknown, it is probably too small for such a vast amount of narcotics. Cocaine is also very expensive in Algeria – costing between €145-290 per gram. It was more likely being transited through Algeria for final distribution in Europe and the Middle East. Second, it means this route – from Brazil to Spain and then Algeria, including its final destination market – had no doubt been tested and carefully secured through smaller transactions. Before sending such large quantities, drug cartels typically secure routes and have in place strong local partners and final markets. It is no coincidence that Oran was used as a transit port. A major commercial and passenger port located only 200 km from Spain, Oran is strategically positioned for drug trafficking. In January 2015, fishermen discovered more than 81 kg of cocaine near the Habibas Islands, only 10 km from the city’s shores. The chemical characteristics of the Habibas seizure match those of several smaller confiscations made by the police in recent years. This suggests that the cocaine transiting via Algeria might be related to an exclusive supplier. Before the Oran operation, the most recent significant cocaine seizure in Algeria occurred in 2015, when 156 kg were discovered at the Baraki port. In this instance, the narcotics were concealed in a food container carrying powdered milk imported from New Zealand and transiting via Spain towards Algeria. It’s significant that both seizures occurred in port zones, in containers destined for Algerian shores. Algeria has increasingly become part of the global economy since the mid-2000s, with imports rising from US$15.25-billion in 2005 to US$48.6-billion in 2016 – a growth of 318%. This is due to the adoption of a massive import policy supported by significant oil revenues in the 2000s. The Oran cocaine bust in Algeria echoes a similar seizure in Morocco, where 2.4 metric tons of cocaine were confiscated near Rabat in October 2017. In February 2018, Moroccan authorities confiscated 541 kg of cocaine in a cargo ship coming from Brazil and directed to Casablanca. Cocaine trafficking in the Maghreb has been at an all-time high since 2016, suggesting the emergence of new routes. 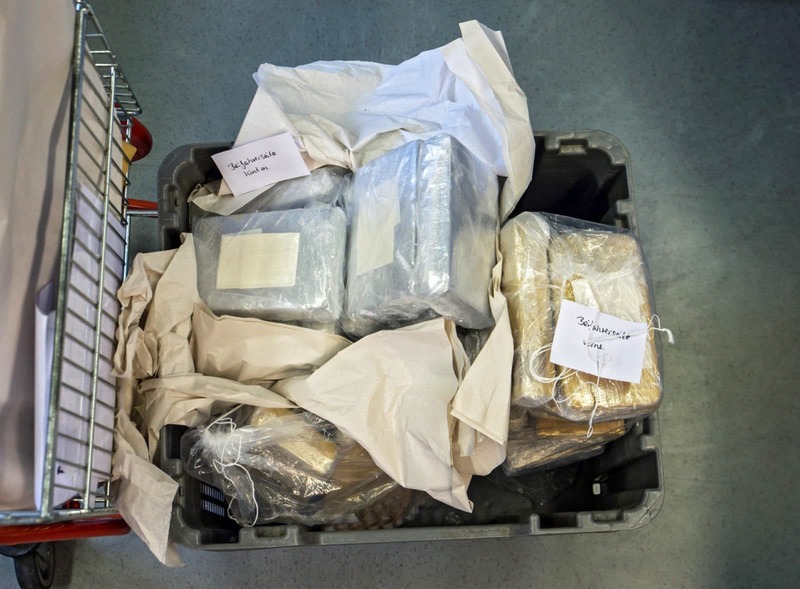 According to the United Nations Office on Drugs and Crime World Drug Report (2018), the amount of cocaine seized in North Africa increased six-fold in 2016, and accounted for 69% of the quantity seized in Africa. Traditionally, narcotics from South America reach Africa from the west coast before being distributed in Europe and the Middle East. Developments in Morocco and Algeria suggest that cocaine is increasingly transiting through the north-west coast. This trend seems to be facilitated by historical cannabis routes that start in Morocco. There is a proven connection between South American drug cartels and Moroccan cannabis traffickers, who in turn have strong networks in north-west Algeria. These alliances position North Africa as a promising transit hub for cocaine trafficking. The stretch of coastline between Casablanca and Algiers, passing by Oran and Rabat, is a “golden arch” for drug traffickers. It offers an open window on three continents and close proximity to European consumer markets. Dubbed the new North African “cocaine coast”, drug trafficking is likely to flourish here in years to come. This is not only due to its proximity to the lucrative cocaine market in Europe, but also given difficulties in crossing the conflict-prone Sahel-Sahara region. Combating this new trend calls for greater inter-regional and inter-continental cooperation against drug trafficking. Joint maritime operations aimed at curbing cocaine trafficking, such as the one conducted by Spain and Morocco, are recommended. Algeria’s naval forces should strengthen security along key ports, and customs authorities must reinforce controls on imports arriving on container ships. The so-called Green Corridor policy, which allows experienced importers to accelerate the entrance of goods and commodities, should be reviewed to better align with international standards set for example by the World Customs Organisation.